Tsunamic technological innovation could soon bring profound improvements to how society uses energy. To capitalize on these improvements, energy managers must increase their understanding and knowledge of their facility now. Innovation continues to play a large role in transforming how we manage electrical power. From the Melbourne Cricket Ground, the world’s 10th largest stadium, to the 1,000 Marriott hotels being built in China, Schneider Electric partners are discovering new ways through which innovation can cut their costs, reduce downtime, and increase efficiency. Understanding newer connected IoT technologies becomes imperative as innovation fundamentally changes the way energy is processed, distributed, and managed all the way from plant to plug. 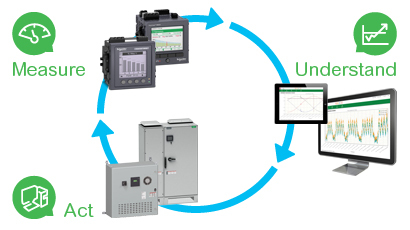 Understand is the second of a three-prong Schneider Electric power management approach: Measure, Understand, Act, that rests on modular, interoperable technologies tailored both to meet your immediate needs and scale as your needs change. To see how “Measure” is the first cornerstone to optimizing your facility, read the blog post How to Measure Power and Energy and the Critical Benefits it Provides Your Facility. As the saying goes: “Knowledge is Power” and in your facility, this is both figuratively and literally true! The greater your understanding and intuition of your power consumption data, the greater the benefits you gain. The key to optimizing your power is to operate your facilities with a clear understanding of both your electrical data (energy, current, power etc.) and your facility contextual data (operating characteristics, weather, production data etc.). With this understanding, you can use power in the right way at the right time, avoiding costly inefficiencies. Avoid or minimize costly shutdowns and stay up and running at all times. In other words, save money! Power management software provides you with the ability to examine usage patterns and uncover inefficiencies and energy waste as well as manage and track improvement programs. Maximize the investment you’ve made in electrical assets and equipment by optimizing capacity and performance without losing reliability. Comply with international standards for energy management and power quality like ISO50001, IEEE519 etc. How do you achieve these benefits with software? See power events when they occur. Access visual operator displays and controls. View real-time energy fluctuations and use. 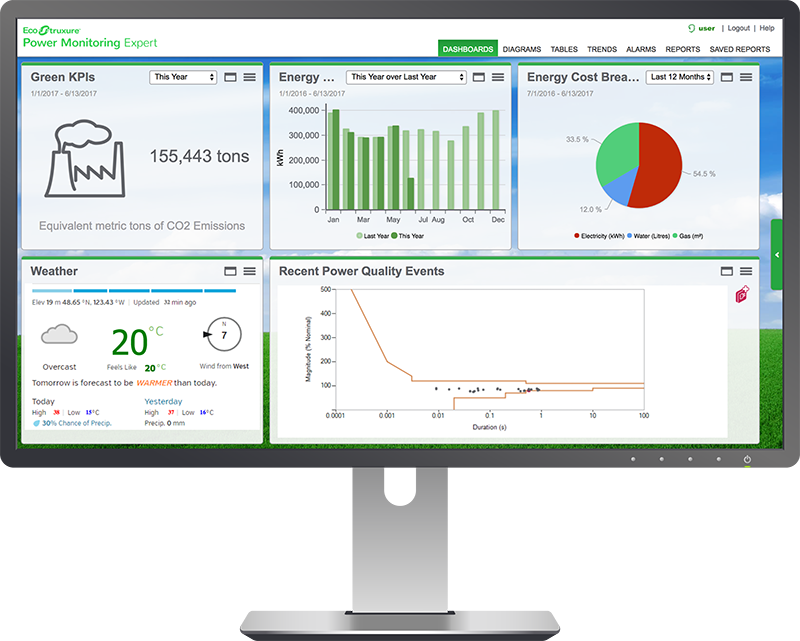 View power and energy data in easy-to-understand dashboards and reports. See trends, benchmark progress and understand otherwise-hidden power quality issues and events. Use custom device comparison tables for an at-a-glance status of the assets in your network. Get immediate alerts of issues. View millisecond-accurate alarms and trends. Obtain sequence of events information to locate the source of disruptions. Understand root cause analysis and proactively manage power quality issues. Track anomalies in energy usage to make corrections. Easily connect various smart meters, controllers and sensors to the power management software platform. So, what does this look like in the real world? In the past 30 days, which of my colocation customers has consumed more energy? Which circuit breaker should I target with this quarter’s maintenance budgets? Is the power (kW) draw on PDU A6 over its rated capacity? In December, what percentage of energy was used while my assembly line was idle or starved of parts? Why did my Energy Usage Intensity (kWh/bottle) increase in October compared to September? Such detailed understanding of your facility means dollars saved and a healthier bottom line.